I returned to the State Theatre again last night to catch The Wind Rises, reportedly the final film of noted Japanese animator Hayao Miyazaki. I wasn’t quite sure what to make of this fact-based animated drama, focused on the life of Jiro Horikoshi, an aviation designer who contributed to the building of Japanese fighter planes during World War II. 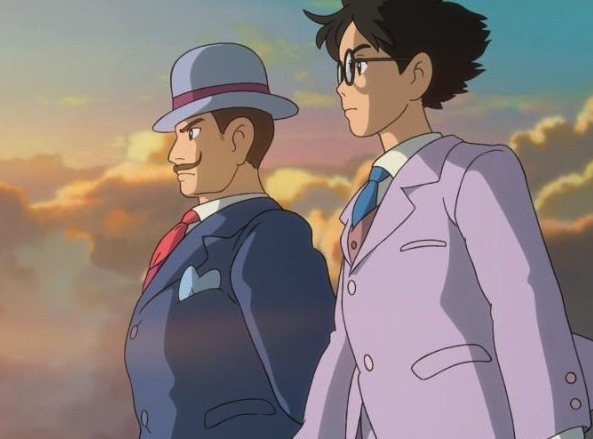 The film boasts typically beautiful designs from Miyazaki and his cohort, with one image pictured here. But the storyline confuses somewhat (admittedly likely due to my unfamiliarity with the topic) jumping around in time and seeming to go back and forth with the main character’s focus and motivations. I also wished that I had chosen to see it with subtitles rather than dubbing, as the American voice cast (Joseph Gordon – Levitt, Emily Blunt and others) performed well but also distracted from the story. A provocative tale for sure. I’ll be thinking about this one further in the near future. Posted on March 23, 2014, in Movies. Bookmark the permalink. Leave a comment.